Welcome back to Orphan Black, the hit show about clones and characters casually explaining their darkest secrets. Want to know P.T. Westmoreland’s mysterious past? Here’s Susan Duncan, spelling it out in a conversation for you. Curious about Mrs. S’s intelligence-gathering operation? Here she is, laying it all out for Sarah except for the weird detail of not telling her the final source, which will presumably be revealed at a more important moment. These are things we need to know as the show winds down, but the methods by which they’re divulged to us are not the most subtle. Why was Delphine’s participation a secret until Mrs. S randomly decided it didn’t need to be? And why would P.T. ask Susan if she remembered who he was? Of course she remembers, she was there. This clears up whether or not Susan is in on the secret (obviously she is), but it’s such an awkward way to reveal it. If this show hadn’t been so determined to drip out information over the years, they wouldn’t have to blast out plot developments in every episode in a way that totally sidelines Felix, Alison, and Helena, all of whom have operated as the beating heart of the show over the seasons. Felix’s absence is particularly galling. This is the character who we’re told from the very beginning of the show is the most important person in Sarah’s life, apart from her daughter. Remember when she was going to run away with him and Kira and Alison’s money in Season 1? Clearly, her inner circle has expanded in the years since, but that shouldn’t mean he’s no longer an important part of what’s going on. He’s literally represented by a fax in this episode. And it’s hard to imagine a more tantalizing subplot than watching Felix, Delphine, and Adele commit corporate espionage in Switzerland. The outfits alone would have been worth it. Relegating all of this to an aside from Mrs. S is an odd way to handle this development. And over on the other side of the show, we get the plot that reminds us how fun the show can be when it sticks to the clones outsmarting everyone. There’s almost an electrical charge running through scenes with Krystal. It’s like you can feel how much fun everyone has with the character. But as entertaining as she is, she’s also another example of the ways in which the Neolutionists deeply underestimate the clones, over and over again. 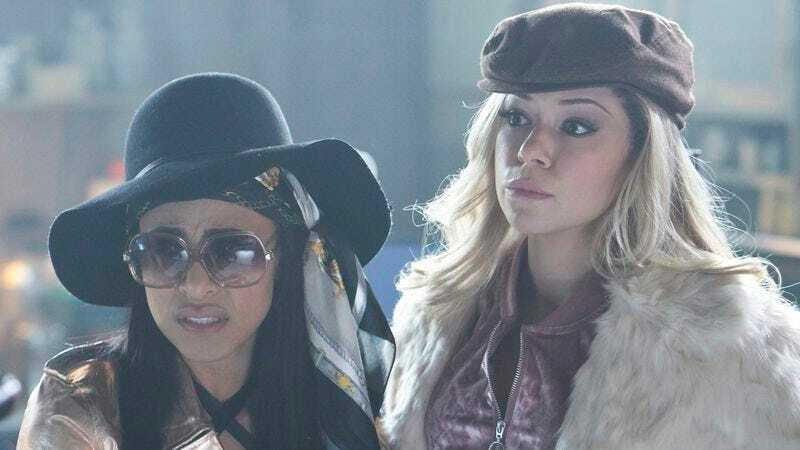 They’re willing to concede that Sarah is dangerous, as is Helena, and that Cosima is an asset to be cultivated aggressively, but the arrogance that pervades every part of the movement means that Krystal is somehow running circles around them. How many people react to her the exact same way Len does, assuming that she’s just as frivolous as she seems and that she couldn’t possibly figure anything out? The in-joke casting of Tom Cullen, Tatiana Maslany’s boyfriend, in the role, is pretty cute, especially considering his part ends with him getting kicked in the balls and forcibly depilated. The whole thing still works even if you don’t know that bit of trivia, but it adds that extra bit of zest to him whining about his beard. It’s also a perfect character note for a douchey guy like Len, that giving up corporate secrets is nothing compared to the loss of his majestic beard. Tom Cullen is clearly a good sport. What happens on the island is ultimately a necessary bit of moving the game pieces around the board, but the whole thing feels rushed and a little mechanical. And we never really understood who the island residents were, or why P.T. decided to bring them to the island. Some of them were apparently researchers, but given their response to Cosima as a scientist, many of them were definitely not. Will those people safely depart back to a mainland somewhere? That’s a lot of people very motivated to go public with what they know about Neolution. Can the organization really accept this many leaks? Moreover, why didn’t they storm the house to confront Westmoreland? But at least we’ve finally gotten Cosima off the island. Good thing we learned last episode that she comes from a boating family. And now we have the general outline of what the bad guys are trying to do, both in an immediate sense of the Manning ladies, and in a broader, more global sense. Which leaves plenty of room for the show to refocus on its core folks in our last four episodes. We lost three characters this episode, as Aisha, Susan Duncan, and presumably Ira all meet their ends. I hope we see some repercussions for the Neolutionists cruelly not curing Aisha despite the fact that they seemed to know how to. Speaking of Susan, how is Rachel going to react to this news? Theoretically, she’s pretty merciless about her mother, but she’s always had conflicted feelings about her parents. She may not have wanted this decision taken out of her hands. Very curious to see how Mrs. S’s threat about Rachel needing them comes through. No, but obviously the best part is Sarah saying “OK, steer him to Dyad. Don’t make it obvious.” And Krystal following up by saying, “Len, you sold your company to Dyad.” Her tendency to respond to her handlers in front of Len was also enjoyable. Did everyone notice that Sarah was grinning while watching Krystal beat up Len? Bets on Cosima adopting Charlotte at the end of the show? Though I have no clue what kind of documentation anyone has for her at this point. She’s been through a few guardians, all off the books. That Wordsworth poem, if you’re curious. This show loves its literature. Relevant information about Tom Cullen.